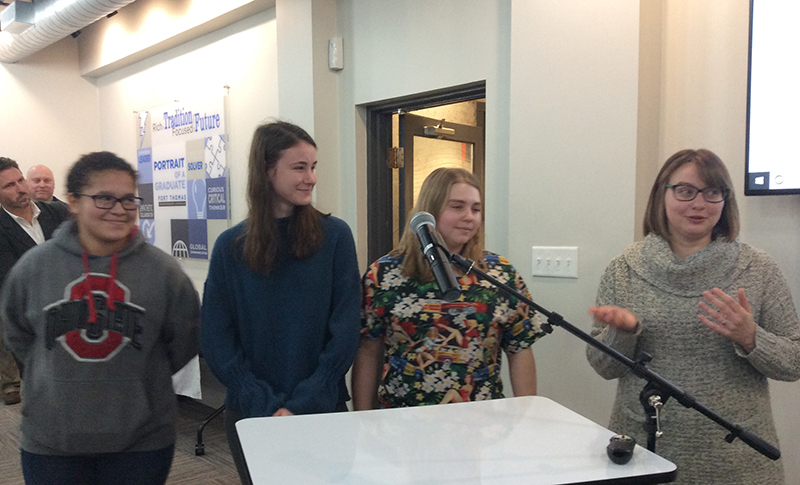 Highlands High School teacher Megan Boimann-Hennies and team members describe the We the People competition. The Highlands High School We the People Team racked up yet another state championship recently, adding their 15th consecutive state win and their 16th overall. We the People is a national student competition to promotes civic education with an emphasis on knowledge of the U.S. Constitution and Bill of Rights. Now that the team has won state, they will head to Washington, D.C. for the competition to be held from April 26 to 30 at the National Conference Center. The Highlands team was honored at the January school board meeting. There are 16 students, all seniors, on the team. Team members Micheala Brown, Betsy Sellers and Sydney Cooper were on hand to represent the team. Team advisor and teacher Megan Boimann-Hennies said this year was significant first for the 15th win but also because it is the first year the program offered an independent study option for students who could not fit the traditional class into their schedules. This year, four students took advantage of the opportunity and Boimann-Hennies says she hopes their success will lead to more opportunities for schedule revision next year. The students plan to visit significant places in our constitutional history. They are busy studying past questions in preparation for the event. They will receive official study questions at the end of this month. At nationals the team will be up against more than 1,200 students from 56 high schools from across the country. They will be tested on their knowledge and understanding of institutions of American constitutional democracy and will participate in a simulated congressional hearing.